Download "6.0 Procurement procedure 1 Infrastructure"
2 Page Definition Purpose The infrastructure procurement procedure covers those activities involving the purchase of: new infrastructure or additions or improvements to existing infrastructure renewal of infrastructure assets the maintenance and repair of existing infrastructure assets to restore their functionality to original levels the operation of those assets in a way that optimises the benefits derived from them. Typical infrastructure outputs include: new land transport infrastructure (eg roads and bridges) new public transport infrastructure (eg bus stations, park and ride facilities) new traffic management and passenger information systems additions or improvements to existing road infrastructure (eg passing lanes, curve realignments and on-ramps) alterations and additions to existing public transport infrastructure renewal of road pavements and resurfacing maintenance and repair of infrastructure assets (eg roads, bridges and passenger transport facilities), which are often routine in nature and delivered under a term service contract. This procurement procedure covers both the physical works and professional services outputs required to deliver operation, maintenance, renewal and construction of infrastructure. Professional services associated with infrastructure activities can also be purchased using procurement procedure 2 planning and advice. This option allows the purchaser more flexibility and choice, where required, to better align the procurement procedure with the activity. Note that this procurement procedure does not apply to the use of in-house professional services that have the NZTA s prior approval. 3 Page Definition continued Summary of requirements Approved organisations must follow the requirements below when using this procurement procedure. Definition The activity must fit within the definition for infrastructure procurement. Strategic context To use this procurement procedure, an approved organisation must understand the procurement activity s strategic context. This will enable the approved organisation to fully specify the outputs that are required and to understand the activity s complexity, scale, timing, innovation potential and risk, and assess the supplier market. Delivery models All approved organisations are permitted to use the staged and the design and build delivery models, as outlined in this procurement procedure. The advanced delivery models (shared risk and supplier panel) can only be used with the NZTA s prior written approval under s25 of the LTMA. Supplier selection methods All approved organisations are permitted to use the supplier selection methods referred to in this procurement procedure. The quality based supplier selection method is an advanced component where the output being purchased is anything other than professional services. As an advanced component, an approved organisation must have the NZTA s prior written approval under s25 of the LTMA for its use. Rules The rules set out in chapter 10 Rules must be followed. Further assistance Contact the NZTA if you are not sure if the activity conforms to the requirements of the infrastructure procurement procedure, or if you wish to depart from the rules contained here. 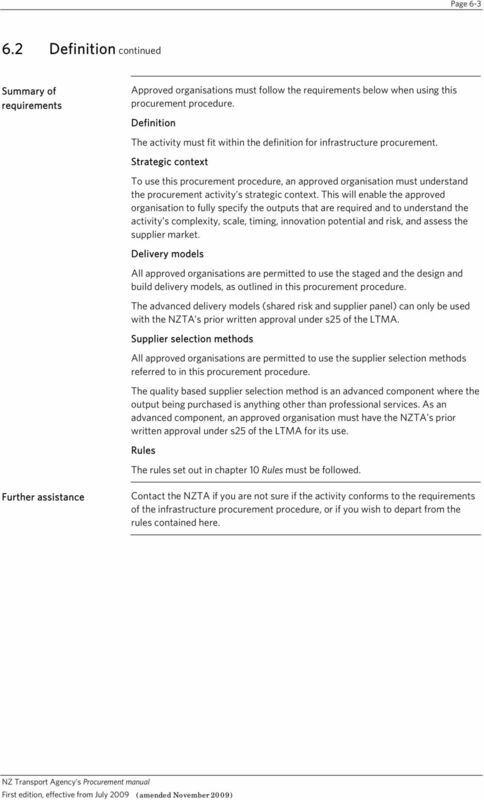 4 Page Strategic context Rule An approved organisation must, as part of its assessment of the strategic context, assess all proposed procurement activity against the objectives set out in a procurement strategy, which has been endorsed by the NZTA. 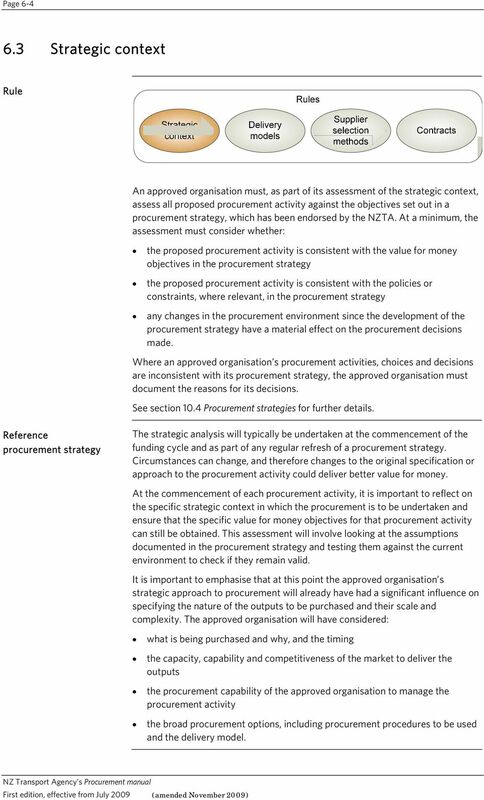 At a minimum, the assessment must consider whether: the proposed procurement activity is consistent with the value for money objectives in the procurement strategy the proposed procurement activity is consistent with the policies or constraints, where relevant, in the procurement strategy any changes in the procurement environment since the development of the procurement strategy have a material effect on the procurement decisions made. Where an approved organisation s procurement activities, choices and decisions are inconsistent with its procurement strategy, the approved organisation must document the reasons for its decisions. See section 10.4 Procurement strategies for further details. Reference procurement strategy The strategic analysis will typically be undertaken at the commencement of the funding cycle and as part of any regular refresh of a procurement strategy. Circumstances can change, and therefore changes to the original specification or approach to the procurement activity could deliver better value for money. At the commencement of each procurement activity, it is important to reflect on the specific strategic context in which the procurement is to be undertaken and ensure that the specific value for money objectives for that procurement activity can still be obtained. This assessment will involve looking at the assumptions documented in the procurement strategy and testing them against the current environment to check if they remain valid. It is important to emphasise that at this point the approved organisation s strategic approach to procurement will already have had a significant influence on specifying the nature of the outputs to be purchased and their scale and complexity. The approved organisation will have considered: what is being purchased and why, and the timing the capacity, capability and competitiveness of the market to deliver the outputs the procurement capability of the approved organisation to manage the procurement activity the broad procurement options, including procurement procedures to be used and the delivery model. 5 Page Strategic context continued Reference procurement strategy continued The analysis and conclusions on the above factors will have enabled the approved organisation to specify the required outputs during activity formulation and the development of a procurement strategy. To ensure that the specified outputs and the proposed approach to the procurement activity will obtain best value for money, the proposed approach must now be assessed to ensure consistency against the original objectives in light of the current situation. The following checklist provides guidance on the matters that should be considered when undertaking this assessment. This process will ensure a full understanding of the strategic context for the particular procurement activity. Strategic consideration Questions for approved organisations 1. Is there a clear statement of the outputs to be purchased? 2. Is there clear alignment to the objectives as stated in the procurement strategy? 3. Is there appropriate procurement capability (either internal or external) to undertake the activity? 4. What is the status of the supplier market? 5. What are the risks and opportunities? Have all elements of the output been clearly specified? Do you have a good understanding of the expected price that you will have to pay for the outputs? Does your approach to this procurement activity still align with your strategic priorities? Is your proposed approach to aggregation and bundling (where relevant) consistent with your procurement strategy? Is there any reason why this procurement activity should no longer proceed? Are the identified economic, environmental and social considerations still relevant? Do you have the capability to undertake the procurement activity? If not, where are the gaps and how is the required capability to be resourced? Do you have the necessary resources to deliver and monitor the contract? Are the risks associated with the procurement activity understood and quantified? Who is best placed to manage this risk? Have there been any significant and relevant changes to the supplier market (ie number of suppliers, competitiveness of the market) that will affect your intended approach to the procurement activity? Are any other approved organisations purchasing similar goods and services? Is the proposed timing of your procurement activity able to be accommodated by the supplier market? Are the identified risks and opportunities still relevant? At the end of this step, the approved organisation will determine if the original assumptions as documented in the procurement strategy, as they relate to this procurement activity, still hold true. If circumstances have changed and better value for money can now be obtained by an alternative approach, consider what can be done differently while acknowledging that the options at this stage are limited. 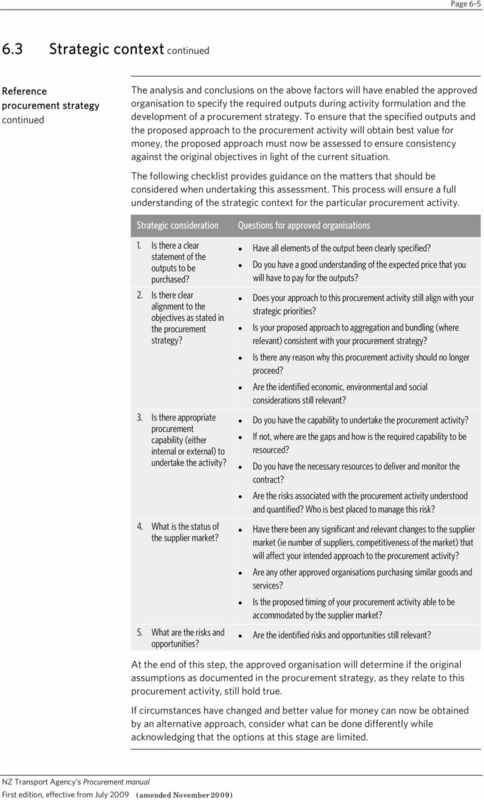 6 Page Strategic context continued Confirm strategic context Where the particular circumstances in which the activity is to be undertaken have changed since the procurement strategy was prepared and there is potential to enhance value for money through an alternative approach to the procurement activity, an approved organisation should take this into account. For example, there may now be opportunities to: collaborate with other approved organisations on the procurement activity aggregate or bundle a number of procurement activities into one larger procurement activity in order to obtain a pricing advantage through scale take advantage of innovation change the timing for the procurement activity. In the event that an alternative approach is chosen as the most effective way to obtain better value for money, the purchaser should adopt this approach and fully specify the procurement activity in light of this changed assessment. 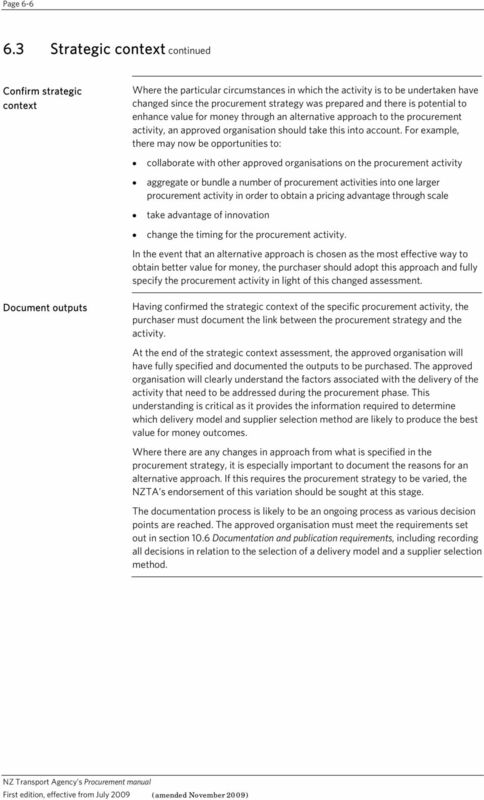 Document outputs Having confirmed the strategic context of the specific procurement activity, the purchaser must document the link between the procurement strategy and the activity. At the end of the strategic context assessment, the approved organisation will have fully specified and documented the outputs to be purchased. The approved organisation will clearly understand the factors associated with the delivery of the activity that need to be addressed during the procurement phase. This understanding is critical as it provides the information required to determine which delivery model and supplier selection method are likely to produce the best value for money outcomes. Where there are any changes in approach from what is specified in the procurement strategy, it is especially important to document the reasons for an alternative approach. If this requires the procurement strategy to be varied, the NZTA s endorsement of this variation should be sought at this stage. The documentation process is likely to be an ongoing process as various decision points are reached. The approved organisation must meet the requirements set out in section 10.6 Documentation and publication requirements, including recording all decisions in relation to the selection of a delivery model and a supplier selection method. 7 Page Delivery models Rule All approved organisations are permitted to use the staged and the design and build delivery models, as outlined in this procurement procedure. The advanced delivery models (shared risk and supplier panel) can only be used where an approved organisation has the NZTA s prior written approval under s25 of the LTMA. Introduction The delivery models available for use with this procurement procedure are: staged design and build shared risk (advanced) supplier panel (advanced). 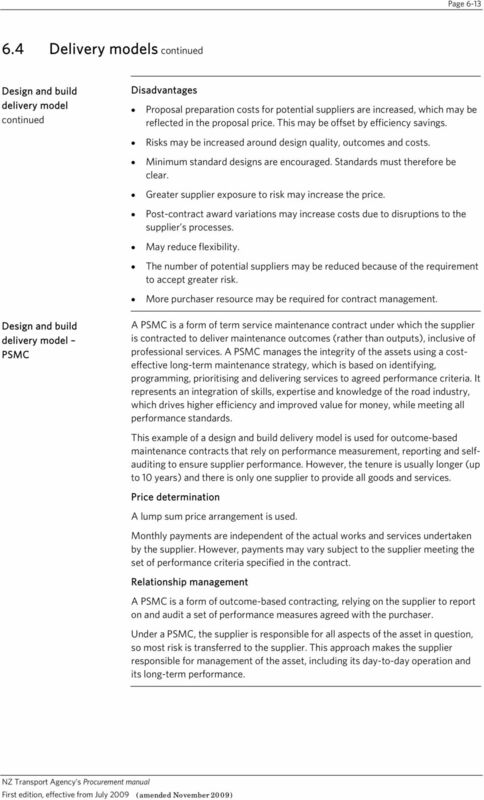 Note that performance specified maintenance contracts (PSMCs) are a commonly used contract option when the purchaser is seeking to establish a term service maintenance contract using the design and build delivery model. A PSMC is an example of the design and build delivery model but is described separately in this chapter. Each delivery model has distinct characteristics that suit particular procurement events. In general, the main factors influencing which delivery model should be applied are determined through reference to: the approved organisation s procurement strategy the defining characteristics of the procurement activity. The defining characteristics of a procurement activity are its complexity, scale, timing, innovation potential, risk and supplier market. 8 Page Delivery models continued Introduction continued The following diagram illustrates the situations in which the staged, design and build and shared risk delivery models may be used. Note that the supplier panel delivery model does not appear in the diagram because it gives purchasers complete flexibility as to the type of contractual arrangement that is established with the supplier. Therefore, an approved organisation may consider its use for any procurement activity. 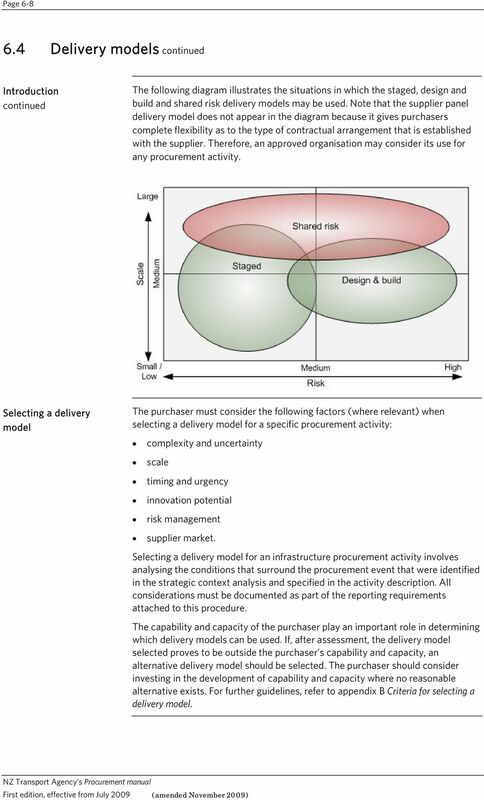 Selecting a delivery model The purchaser must consider the following factors (where relevant) when selecting a delivery model for a specific procurement activity: complexity and uncertainty scale timing and urgency innovation potential risk management supplier market. Selecting a delivery model for an infrastructure procurement activity involves analysing the conditions that surround the procurement event that were identified in the strategic context analysis and specified in the activity description. All considerations must be documented as part of the reporting requirements attached to this procedure. The capability and capacity of the purchaser play an important role in determining which delivery models can be used. If, after assessment, the delivery model selected proves to be outside the purchaser s capability and capacity, an alternative delivery model should be selected. The purchaser should consider investing in the development of capability and capacity where no reasonable alternative exists. For further guidelines, refer to appendix B Criteria for selecting a delivery model. 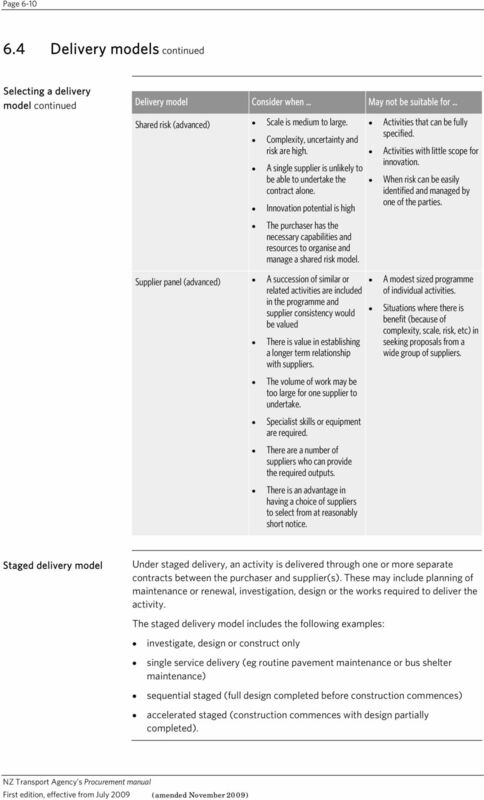 9 Page Delivery models continued Selecting a delivery model continued The following table provides examples of when to consider each delivery model that best fits an infrastructure activity. It describes the circumstances under which it is advisable to use each of the models. Delivery model Consider when May not be suitable for Staged Scale is small to medium. Complexity, uncertainty and risk are low. The approved organisation wishes to maintain some form of involvement and control over the activity. Scope is well defined and the opportunity for innovation is low. Design and build Scale is medium to large. Complexity, uncertainty and risk are correspondingly higher as well. There is more opportunity for the supplier to innovate during delivery. The approved organisation wishes to transfer some risk to the supplier. Design and build PSMC The purchaser requires a supplier to: provide all goods and services to do with maintenance; accept risks; and base performance on self-compliance. Risk allocation is an important factor in the project. It is more advantageous to have one supplier with overall responsibility for both works and services. Incentives can be employed to increase innovation. The contract is larger in scale, over a longer timeframe and more complex. Complex, large-scale activities. Activities with high levels of risk. Activities that require innovation and the capability to manage risk. Activities where the purchaser s requirements and required outcomes cannot be clearly described in the RFP. Activities where a specific design provides more value for money than any alternative design and construction process available in the marketplace. Work that is best assigned to different suppliers (eg professional services and physical works, and for projects where the level and type of risk falls outside of the supplier s ability to manage). 10 Page Delivery models continued Selecting a delivery model continued Delivery model Consider when May not be suitable for Shared risk (advanced) Scale is medium to large. Complexity, uncertainty and risk are high. A single supplier is unlikely to be able to undertake the contract alone. Innovation potential is high Activities that can be fully specified. Activities with little scope for innovation. When risk can be easily identified and managed by one of the parties. The purchaser has the necessary capabilities and resources to organise and manage a shared risk model. Supplier panel (advanced) A succession of similar or related activities are included in the programme and supplier consistency would be valued There is value in establishing a longer term relationship with suppliers. A modest sized programme of individual activities. Situations where there is benefit (because of complexity, scale, risk, etc) in seeking proposals from a wide group of suppliers. The volume of work may be too large for one supplier to undertake. Specialist skills or equipment are required. There are a number of suppliers who can provide the required outputs. There is an advantage in having a choice of suppliers to select from at reasonably short notice. Staged delivery model Under staged delivery, an activity is delivered through one or more separate contracts between the purchaser and supplier(s). These may include planning of maintenance or renewal, investigation, design or the works required to deliver the activity. The staged delivery model includes the following examples: investigate, design or construct only single service delivery (eg routine pavement maintenance or bus shelter maintenance) sequential staged (full design completed before construction commences) accelerated staged (construction commences with design partially completed). 11 Page Delivery models continued Staged delivery model continued Price determination A robust price estimate for each stage, based on the known scope of work, will often be available at the time the supplier is engaged for that stage. The contract price may be a lump sum or taken from a schedule of prices. The scope of work required to complete earlier stages, typically for professional services, is often not well defined at the beginning of those stages. In this case, a contract based on a lump sum or a schedule of prices will not be conducive to obtaining the best value for money. It would be better to select the supplier using the quality based supplier selection method and then negotiate the price or base it on a cost reimbursement model. Relationship management Under a staged model, once design is complete, the roles for all parties are typically well defined and it is possible to clearly specify the outputs with respect to scope, and technical and service details. The outputs are often well understood through past experience. Where the outputs are well defined, the purchaser can maintain more control over delivery and is more able to control scope. The purchaser is more likely to receive appropriate proposals aligned with initial cost estimates. Risk is largely managed by the purchaser. Advantages A high level of purchaser control is possible. Greater certainty over the final outputs (and their cost) is possible. Contract management is simplified as decisions are made solely by the purchaser. Transaction costs for both supplier(s) and the purchaser are reduced. Competitiveness and market efficiency can be encouraged by breaking up larger packages of work to allow a broader range of suppliers to compete for contracts. Disadvantages Separation of designer and builder may not encourage innovation, particularly the ability to design, plan or manage risk out of the delivery process. There will be ongoing and significant involvement of the purchaser in project management. Less coordination between the design and construction stages could lead to buildability issues and higher costs. Design errors may be costly to fix. 12 Page Delivery models continued Design and build delivery model A design and build delivery model uses a single supplier to complete all detailed design and construction. This usually involves a lump sum price arrangement and more risk accepted by the supplier. Under a design and build model, the purchaser prepares a brief, which includes the output specification and quality requirements. A design and build contract is then awarded to carry out concept design, final design development and documentation, and construction of the final output. 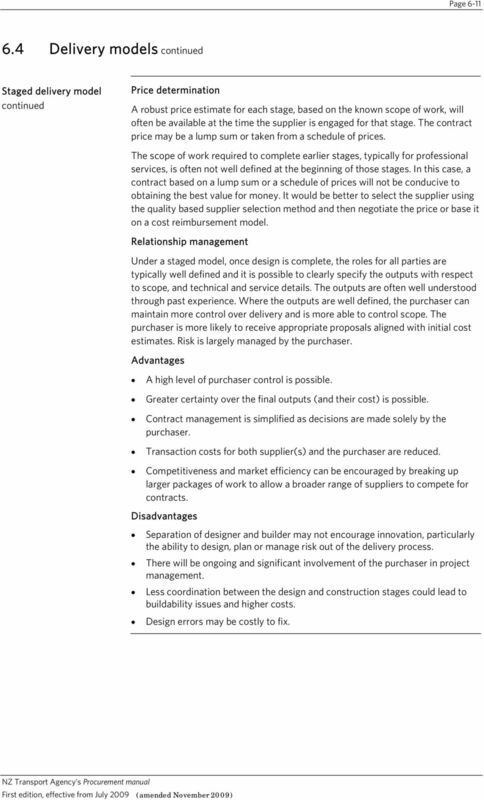 The purchaser may at times complete part of the concept design under a separate contract (a separate stage). The design and build delivery model includes the following examples: design and construct design, novate and construct design, construct and maintain; or design, construct and operate. Price determination The preferred supplier must be able to price the final outputs before a contract is entered into. An iterative process may be used to progressively refine the scope of the final output before the price is agreed. The price is usually a lump sum arrangement and the purchaser pays one price to the supplier for the delivery of the outputs. Relationship management Under the design and build model, risk is transferred from the purchaser to the supplier, with the supplier assuming responsibility for delivery. With the transfer of risk, the purchaser has less need to be involved in the detailed design and construction this is the responsibility of the supplier. The purchaser instead focuses on ensuring that the desired outcomes can be achieved. Advantages Some of the time and cost associated with a staged delivery model can be removed and may lead to quicker start times and potentially earlier construction. The purchaser can concentrate on the outcomes, through a concept design and performance criteria, and not get lost in minutiae. Providing the outputs can be clearly defined, technical and financial risk to the purchaser is reduced as the supplier is responsible for design and construction. The purchaser needs less design resource (design changes will generally be at the supplier s risk). Overlapping design and construction increases the potential for innovation and for obtaining the best value for money spent. Project completion time can be reduced if construction is started prior to the finalisation of detailed design (usually at the supplier s risk). 13 Page Delivery models continued Design and build delivery model continued Disadvantages Proposal preparation costs for potential suppliers are increased, which may be reflected in the proposal price. This may be offset by efficiency savings. Risks may be increased around design quality, outcomes and costs. Minimum standard designs are encouraged. Standards must therefore be clear. Greater supplier exposure to risk may increase the price. Post-contract award variations may increase costs due to disruptions to the supplier s processes. May reduce flexibility. The number of potential suppliers may be reduced because of the requirement to accept greater risk. More purchaser resource may be required for contract management. Design and build delivery model PSMC A PSMC is a form of term service maintenance contract under which the supplier is contracted to deliver maintenance outcomes (rather than outputs), inclusive of professional services. A PSMC manages the integrity of the assets using a costeffective long-term maintenance strategy, which is based on identifying, programming, prioritising and delivering services to agreed performance criteria. It represents an integration of skills, expertise and knowledge of the road industry, which drives higher efficiency and improved value for money, while meeting all performance standards. 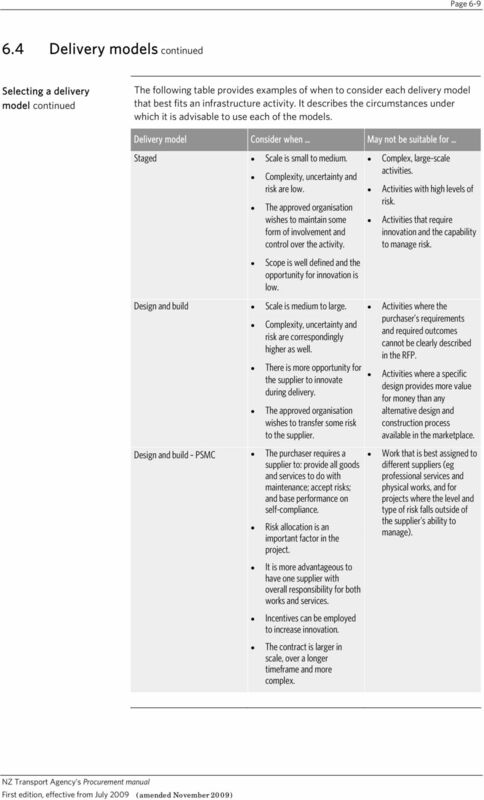 This example of a design and build delivery model is used for outcome-based maintenance contracts that rely on performance measurement, reporting and selfauditing to ensure supplier performance. However, the tenure is usually longer (up to 10 years) and there is only one supplier to provide all goods and services. Price determination A lump sum price arrangement is used. Monthly payments are independent of the actual works and services undertaken by the supplier. However, payments may vary subject to the supplier meeting the set of performance criteria specified in the contract. Relationship management A PSMC is a form of outcome-based contracting, relying on the supplier to report on and audit a set of performance measures agreed with the purchaser. Under a PSMC, the supplier is responsible for all aspects of the asset in question, so most risk is transferred to the supplier. This approach makes the supplier responsible for management of the asset, including its day-to-day operation and its long-term performance. 14 Page Delivery models continued Design and build delivery model PSMC continued Advantages Risk is allocated to the party that is most capable of managing it. Bundling of professional services and physical works functions may increase cost efficiencies and effectiveness. The lump sum and outcome-focused nature of the contract can encourage innovation. Longer-term contractual arrangements facilitate greater information sharing between purchaser and supplier. Self-monitoring by the supplier may reduce purchaser management resource requirements. Disadvantages Premiums may be built into pricing to compensate for additional risk. Monitoring and enforcement costs may increase if poor performance becomes an issue. Further issues A PSMC requires long-term capability and commitment of resources, from both purchaser and supplier. Shared risk delivery model (advanced) A shared risk delivery model uses an integrated team comprising purchaser and supplier participants, which may include designers, builders and material suppliers. Team members are incentivised to work collaboratively and impartially to deliver what is best for the project and to achieve high performance standards. Successful collaboration demands that all parties commercial interests be aligned. Risk is shared by all parties and there are only two possible outcomes to working together: either all parties succeed or all parties fail. No team member can win at the expense of another. The shared risk delivery model includes alliances and competitive alliances. Price determination The price is determined through negotiation involving all team members and is based on cost reimbursement with incentives to add value. A target price mechanism is often used with this model. Relationship management A shared risk model brings together an integrated team of purchaser and suppliers. This approach minimises the barriers to information sharing and reduces negotiation, management and enforcement costs over the contract life. Using this model, the purchaser assumes all risk, but brings together a team to manage and mitigate it. The combined expertise of the team contributes to obtaining the best value for money; all parties work together to determine the best course of action. 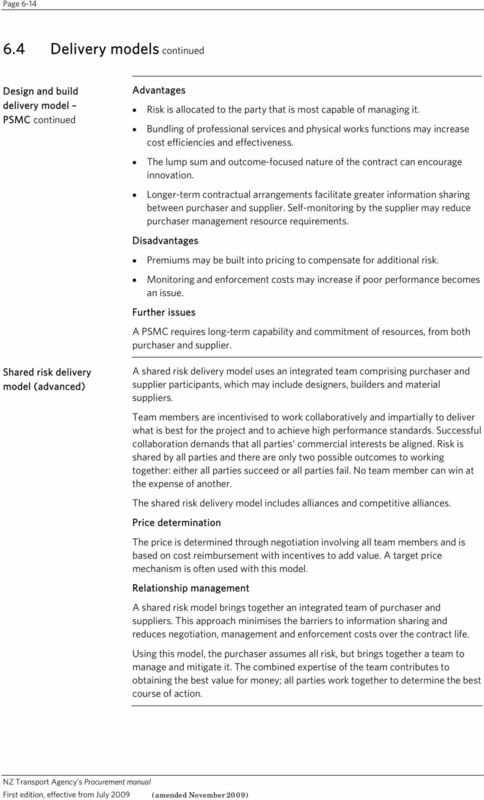 15 Page Delivery models continued Shared risk delivery model (advanced) continued Advantages The contract is collaborative. The team environment and aligned objectives, improve risk management, encourage innovation, leave flexibility to change and ensure a focus on outcome to obtain best value for money. Value can be added by involving the construction and costing experts in the planning and design phases. The team can draw on a wide variety of expertise. There is pricing transparency (including for contingencies). Projects can be more readily fast tracked. Improved coordination increases efficiency. Improved purchaser knowledge and skills. Tender costs are reduced. Disadvantages Direct price competition is removed. All parties are required to invest significant resource. Participants are liable for the performance of other team members. Senior management resource is required to manage relationships. The purchaser s ability to make unilateral decisions is restricted. Risk sharing may limit the number of suppliers willing to participate. 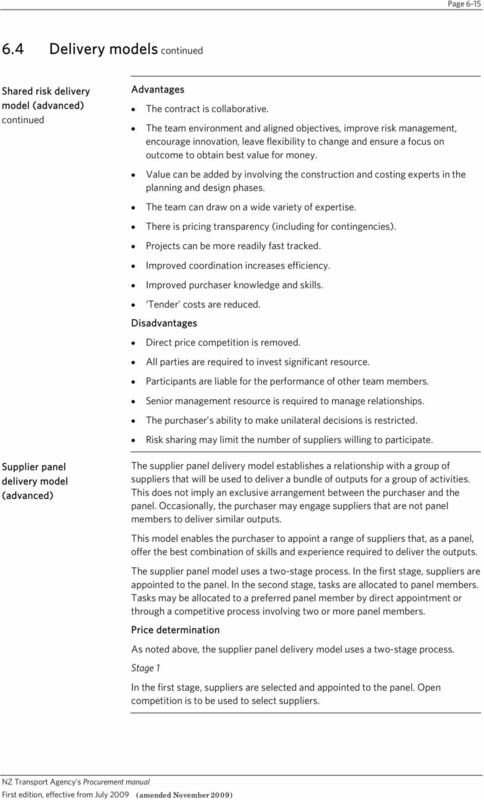 Supplier panel delivery model (advanced) The supplier panel delivery model establishes a relationship with a group of suppliers that will be used to deliver a bundle of outputs for a group of activities. This does not imply an exclusive arrangement between the purchaser and the panel. Occasionally, the purchaser may engage suppliers that are not panel members to deliver similar outputs. This model enables the purchaser to appoint a range of suppliers that, as a panel, offer the best combination of skills and experience required to deliver the outputs. The supplier panel model uses a two-stage process. In the first stage, suppliers are appointed to the panel. In the second stage, tasks are allocated to panel members. Tasks may be allocated to a preferred panel member by direct appointment or through a competitive process involving two or more panel members. Price determination As noted above, the supplier panel delivery model uses a two-stage process. Stage 1 In the first stage, suppliers are selected and appointed to the panel. Open competition is to be used to select suppliers. 16 Page Delivery models continued Supplier panel delivery model (advanced) continued When the suppliers are appointed to the panel, only the broad scope of the work to be undertaken is defined. The price of what will be supplied cannot be settled at the time of engagement. The purchaser and supplier(s) will agree at the time of engagement on a mechanism that will determine the price for the work that a supplier will be asked to deliver. The contract between the purchaser and the suppliers on the supplier panel is usually referred to as a framework contract. Stage 2 In the second stage, work is allocated to panel members. This may or may not involve a competition between suppliers on the panel to win the right to deliver a particular part of the work. The allocation of work can be determined in a variety of ways. The following examples are typical means of allocating work: a non-competitive basis (eg obtaining a quote from any one panel member) a competitive basis (eg obtaining quotes from several panel members) an equal division of work basis a rotational basis a geographic basis a preferred supplier basis (eg some suppliers may be preferred for particular activities, or one supplier is given the opportunity to undertake the work, with other suppliers approached if necessary). The precise mechanism for allocating work to the members of a supplier panel is a strategic consideration. Approved organisations wishing to use a supplier panel will need to set out their expected means of allocating work when seeking approval from the NZTA to use this advanced model. The mechanism for allocating work must be agreed in the framework contract by all parties to the contract. Relationship management The supplier panel model provides for the establishment of collaborative relationships between the purchaser and the suppliers. It should also encourage panel members to have a high level of awareness of the purchaser s requirements. Performance can be incentivised by making the allocation of tasks to panel members dependent on the quality of their performance on earlier panel tasks. The flexibility of this model allows for risk to be managed in ways that best match specific tasks. Advantages There is flexibility to move resources to urgent tasks and to fast-track activities as required. The skills and experience of more than one panel member can be used for the delivery of a specific task. The costs involved in supplier selection and engagement for a programme of many small and similar activities are reduced. 17 Page Delivery models continued Supplier panel delivery model (advanced) continued Purchaser knowledge of supplier capability increases over time because of the ongoing relationship. Supplier knowledge of purchaser requirements increases over time because of the ongoing relationship. Competitive tension between suppliers is maintained over the contract duration. The purchaser can choose from a range of suppliers that, as a panel, offer the best combination of skills and experience required to deliver the outputs. Where more than one panel member has similar skills or experience, the risk of shortages is reduced. Disadvantages The additional costs to both the purchaser and the suppliers of establishing the panel may outweigh any benefits. The opportunities for new suppliers to enter the market are reduced as long as the panel remains in place. The number of suppliers who can submit a proposal is limited to panel members. Supplier panel vs prequalification Supplier panels are sometimes confused with prequalification systems. The table below sets out their important features. Supplier panel Staged process for appointment. Advanced delivery model. A purchaser may have more than one supplier panel. Established once with a finite number of suppliers determined by the purchaser. The supplier for a particular piece of work is determined by a process set out in the framework contract. This may or may not involve competition among panel members. Panel members enter into a contract with the purchaser for a particular project or for a term. Supplier panels, once formed, are not normally reopened for new suppliers to join. Where this is permitted, it would need to be clearly set out in the framework contract. Prequalification Staged process for appointment. Stage in a supplier selection process. A purchaser may have more than one prequalification register. Any number of suppliers can apply to be on a prequalification register. The supplier for a particular piece of work is determined by a competition among all prequalified suppliers. Prequalification registers are usually for particular types of work and are not confined by project or term. There is no contract between the purchaser and the prequalified suppliers. Prequalification registers are updated or opened to new suppliers on a regular basis. 18 Page Supplier selection methods Rule All approved organisations are permitted to use the supplier selection methods referred to in this procurement procedure. The quality based supplier selection method is an advanced component where the output being purchased is anything other than professional services. As an advanced component, an approved organisation must have the NZTA s prior written approval under s25 of the LTMA for its use. Introduction Staged delivery model This section details the process for selecting the most suitable supplier selection method to use in combination with the chosen delivery model. 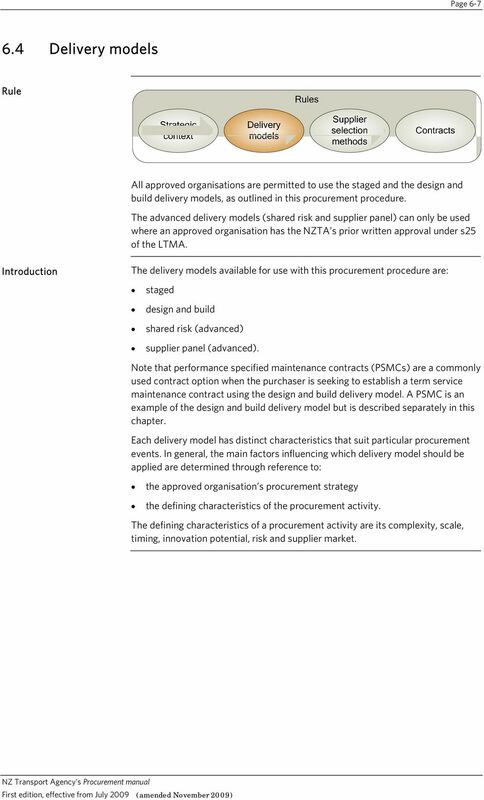 The following tables show the supplier selection methods that provide a good fit with the delivery models specified for this procurement procedure. 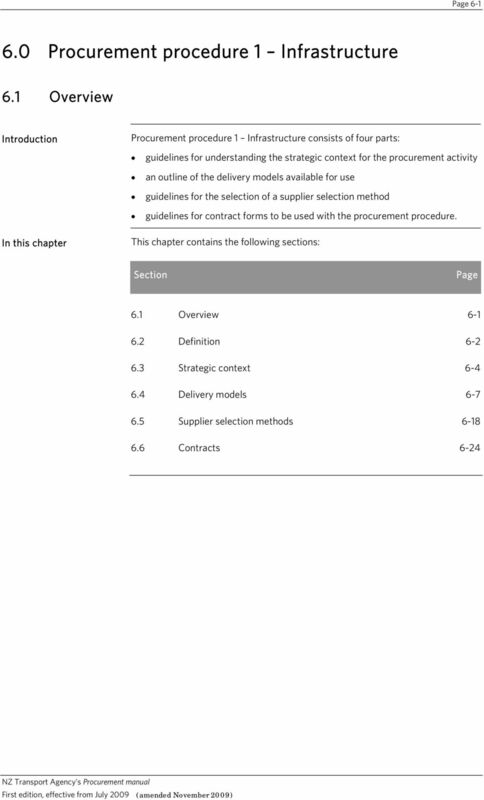 See chapter 5 Supplier selection process for detailed guidelines on the application of the supplier selection methods listed here. See appendix D Procurement procedure decision trees for a graphic which links strategic context, delivery models and supplier selection methods. Note: Under staged delivery, an activity is delivered through one or more separate contracts. Different supplier selection methods may therefore be required for different contracts when using this model. It would be uncommon for the purchaser nominated price supplier selection method to be used to select a physical works supplier under a staged delivery model. 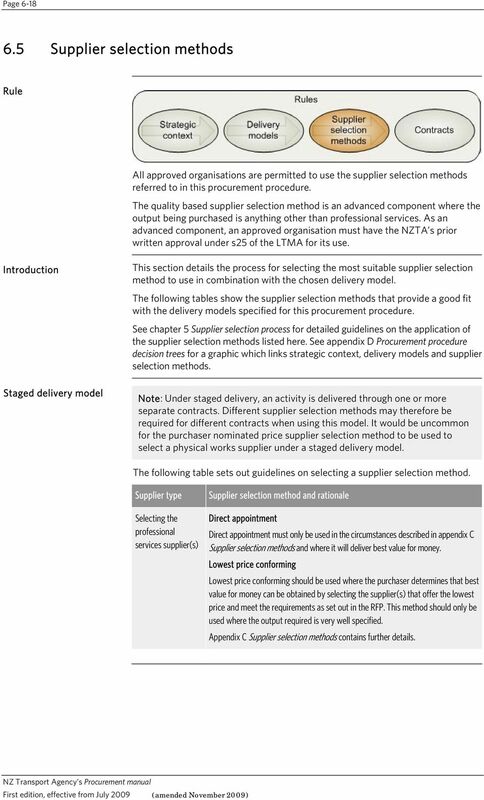 The following table sets out guidelines on selecting a supplier selection method. Supplier type Selecting the professional services supplier(s) Supplier selection method and rationale Direct appointment Direct appointment must only be used in the circumstances described in appendix C Supplier selection methods and where it will deliver best value for money. Lowest price conforming Lowest price conforming should be used where the purchaser determines that best value for money can be obtained by selecting the supplier(s) that offer the lowest price and meet the requirements as set out in the RFP. This method should only be used where the output required is very well specified. 19 Page Supplier selection methods continued Staged delivery model continued Supplier type Selecting the professional services supplier(s) continued Selecting the physical works supplier(s) Supplier selection method and rationale Purchaser nominated price Purchaser nominated price should be used where the purchaser has predetermined the price that it is prepared to pay for the desired outputs. Best value for money is obtained by selecting the supplier that provides the best proposal for the price as set out in the RFP. This method is typically used for such activities as strategy studies, feasibility studies, transportation studies and investigations. Price quality Price quality should be used where the specified outputs can be priced by the supplier(s) and where the purchaser determines that best value for money will be obtained by selecting the supplier that offers the best combination of price and quality requirements as set out in the RFP. Quality based Quality based should be used where the purchaser determines that best value for money can be obtained by selecting the best quality supplier(s) and then negotiating the price with that supplier(s). Direct appointment Direct appointment must only be used in the circumstances described in appendix C Supplier selection methods and where it will deliver best value for money. Lowest price conforming Lowest price conforming should be used where the purchaser determines that best value for money can be obtained by selecting the supplier(s) that offer the lowest price and meet the requirements as set out in the RFP. This method should only be used where the output required is very well specified. Price quality Price quality should be used where the outputs can be priced by the supplier(s) and where the purchaser determines that best value for money will be obtained by selecting the supplier that offers the best combination of price and quality requirements as set out in the RFP. Quality based Quality based should be used where the purchaser determines that best value for money can be obtained by selecting the best quality supplier(s) and then negotiating the price with that supplier(s). Note: This is an advanced component when used for anything other than professional services. 20 Page Supplier selection methods continued Design and build delivery model A design and build delivery model involves appointing a single supplier who assumes responsibility for the overall delivery of the activity and assumes a larger portion of the risk than the purchaser. This therefore requires the purchaser to place greater emphasis on quality when selecting a supplier. It would be uncommon for the purchaser nominated price supplier selection method to be used to select the supplier under a design and build delivery model. 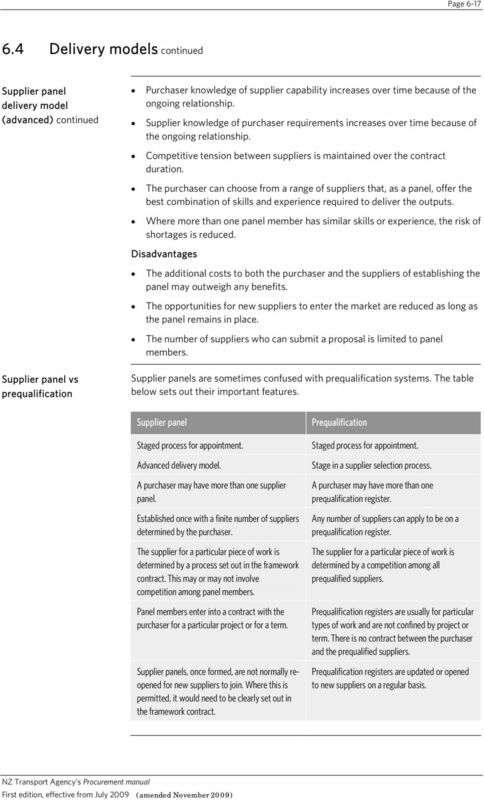 The following table sets out guidelines on selecting a supplier selection method. Supplier type Selecting the supplier Supplier selection method and rationale Direct appointment Direct appointment must only be used in the circumstances described in appendix C Supplier selection methods and where it will deliver best value for money. Lowest price conforming Lowest price conforming should be used where the purchaser determines that best value for money can be obtained by selecting the supplier that offers the lowest price and meets the requirements as set out in the RFP. This method should only be used where the output required is very well specified. Price quality Price quality should be used where the specified outputs can be priced by the supplier and where the purchaser determines that best value for money will be obtained by selecting the supplier that offers the best combination of price and quality requirements as set out in the RFP. Quality based Quality based should be used where the purchaser determines that best value for money can be obtained by selecting the best quality supplier and then negotiating the price with that supplier. Although it would be uncommon for this method to be used with the design and build delivery model, in some circumstances best value for money may be obtained by using this method to select the best supplier and then negotiate a price for the output(s). Note: This is an advanced component when used for anything other than professional services. 21 Page Supplier selection methods continued Design and build delivery model PSMC Under a PSMC, one supplier is engaged to undertake maintenance activity for a nominated term. This focus on long-term maintenance outcomes, along with the inclusion of professional services into an integrated management platform, and the performance-based lump sum nature of the price, means the quality of the supplier is very important. Therefore, price quality is the recommended supplier selection method. It would be uncommon for the purchaser nominated price supplier selection method to be used to select the supplier under a design and build delivery model. 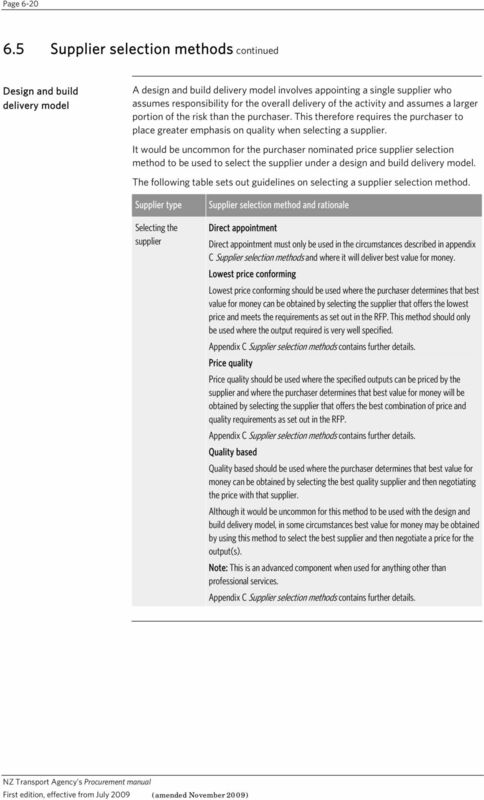 The following table sets out guidelines on selecting a supplier selection method. Supplier type Selecting the supplier Supplier selection method and rationale Direct appointment Direct appointment must only be used in the circumstances described in appendix C Supplier selection methods and where it will deliver best value for money. Lowest price conforming Lowest price conforming should be used where the purchaser determines that best value for money can be obtained by selecting the supplier that offers the lowest price and meets the requirements as set out in the RFP. This method should only be used where the output required is very well specified. Appendix C Supplier selection methods containsfurther details. Price quality Price quality should be used where the specified outputs can be priced by the supplier and where the purchaser determines that best value for money will be obtained by selecting the supplier that offers the best combination of price and quality requirements as set out in the RFP. Quality based Quality based should be used where the purchaser determines that best value for money can be obtained by selecting the best quality supplier and then negotiating the price with that supplier. 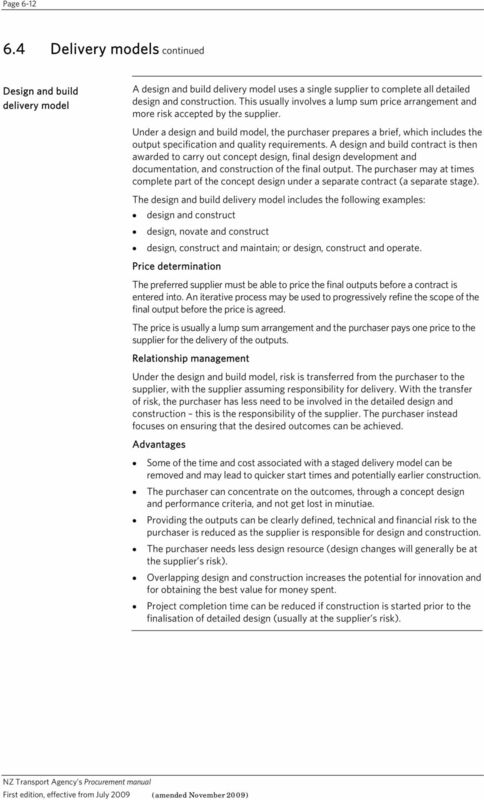 Although it would be uncommon for this method to be used with a PSMC example of the design and build delivery model, in some circumstances best value for money may be obtained by using this method to select the best supplier and then negotiate a price for the output(s). Note: This is an advanced component when used for anything other than professional services. Shared risk delivery model (advanced) A shared risk model should be used for activities that have high levels of uncertainty. The transfer of risk to the party best able to manage it and the potential for innovation are important features of this delivery model. These features, when combined with the scale and uncertainty of the activity, indicate that a focus on the quality of the supplier is of high importance. 22 Page Supplier selection methods continued Shared risk delivery model (advanced) continued Typically, only the price quality and quality based supplier selection methods are used with a shared risk model. Direct appointment may sometimes be used. 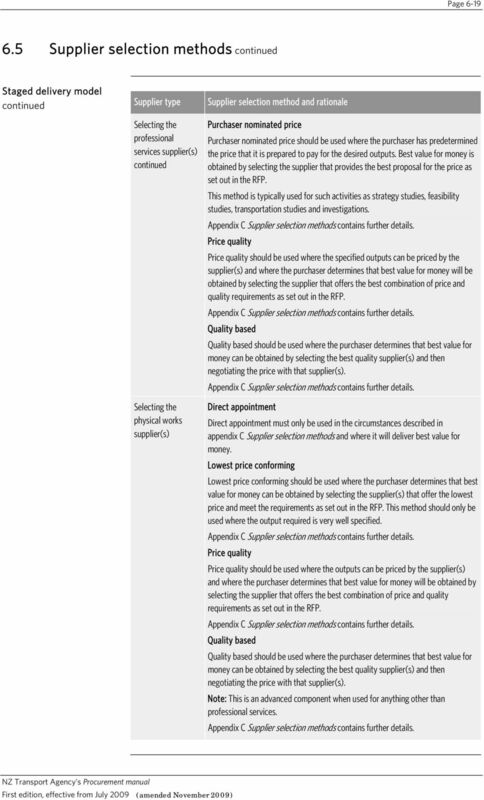 The following table sets out guidelines on selecting a supplier selection method. Supplier type Selecting the supplier(s) Supplier selection method and rationale Direct appointment Direct appointment must only be used in the circumstances described in appendix C Supplier selection methods and where it will deliver best value for money. Price quality Price quality should be used where the specified outputs can be priced by the supplier(s) and where the purchaser determines that best value for money will be obtained by selecting the supplier(s) that offer the best combination of price and quality requirements as set out in the RFP. It is uncommon to use this method with a shared risk delivery model as the price is usually established by negotiation. However, respondents to a proposal may be asked to submit a management fee that would be used as the price when applying this method. Alternatively, they may be asked to price a proxy schedule that would be used in the supplier selection process and later as the basis for negotiation of the actual price of the works and services. As an example, the competitive alliance approach typically uses the price quality supplier selection method to select the preferred supplier from the two suppliers engaged to prepare and price competitive proposals. Quality based Quality based should be used where the purchaser determines that best value for money can be obtained by selecting the best quality supplier(s) and then negotiating the price with that supplier(s). Note: This is an advanced component when used for anything other than professional services. 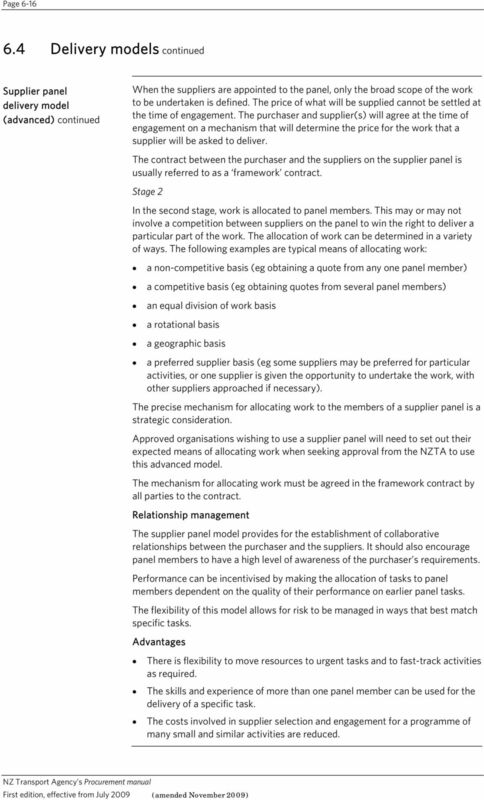 Supplier panel delivery model (advanced) The selection of the supplier panel should be undertaken as a staged process, with stage 1 focused on the appointment of suppliers to the panel and stage 2 allocating work to panel members. Stage 1: Appointing suppliers to the panel Panels can be appointed through the price quality or quality based supplier selection methods. For the price quality supplier selection method, a proxy schedule is commonly used to determine price. Note: The quality based supplier selection method is an advanced component when used for anything other than professional services. 23 Page Supplier selection methods continued Supplier panel delivery model (advanced) continued Stage 2: Allocating work to panel members This stage involves selecting a member of the supplier panel to carry out a particular activity. The specific process for allocating work will be part of the detail that requires approval by the NZTA for use by the purchaser. 24 Page Contracts Introduction Once a preferred supplier is selected, an approved organisation will enter into a contract with that supplier. The contract establishes the form of the relationship between the parties and stipulates the terms and conditions for the purchase of the outputs. Scope of contracts The scope of contracts will vary according to the outputs to be purchased. 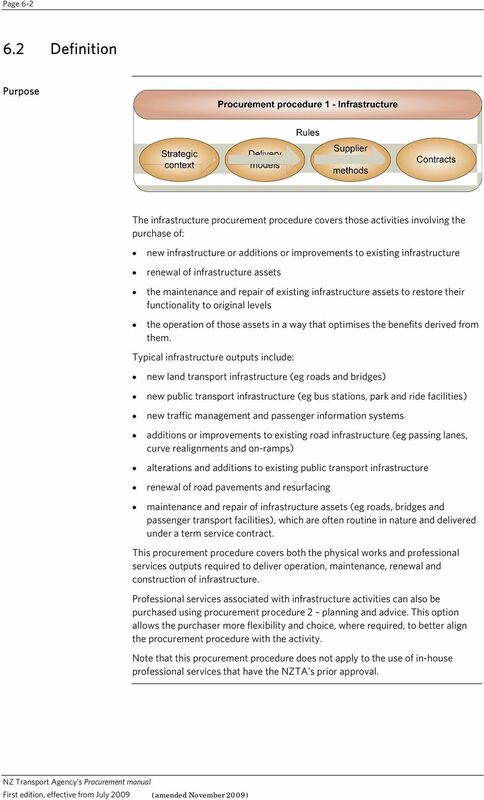 Infrastructure contracts should cover: description of the outputs being purchased term of contract price and review mechanisms (where applicable) processes to remedy defects (including period allowed to remedy defects after the contract end date) standard terms and conditions (eg limitation of liability and insurance) health and safety requirements variations and time extensions disputes resolution contract default conditions and termination processes other issues that may be specific to the individual procurement. In some situations, the full specification of the outputs may not be possible due to the scope and complexity of the activity. Activities that are well defined can be more fully specified in the contract than activities that are more broadly defined at the outset and then become better defined as the activity is undertaken. It may sometimes be difficult to specify every potential contingency that could arise during the contract period. 25 Page Contracts continued Form of contract Contract form is individual to a particular activity. The decision on contract form rests with the approved organisation. However, approved organisations are encouraged to use standard form contracts, wherever possible. The efficiencies from using a standard form contract are easily lost when an individual purchaser chooses to modify the standard form. A number of standard form contracts can be used. Factors that will assist an approved organisation to choose a standard form contract include: type and number of supplier(s) form of relationship type and volume of output(s) scale and complexity risk management strategy and incentives. Standard form contracts used in New Zealand include: NZS 3910:2003 Conditions of contract for building and civil engineering construction. This standard form is widely used for infrastructure physical works. Usually with this contract form, the contractor constructs the works in accordance with the design provided by the engineer. However, it may also be suitable for contract works for which the contractor, wholly or partly, has design responsibility. Published by Standards New Zealand ( NZS 3915:2005 Conditions of contract for building and civil engineering construction (where no person is appointed to act as engineer to the contract). This standard form is used in situations where the purchaser administers the contract directly. The intent and content of this Standard is aligned with NZS 3910:2003. Published by Standards New Zealand ( NEC3. This international standard form includes a suite of standard contracts covering both construction and professional services. The NEC3 contracts are designed to support a more collaborative approach to procurement than is the case with more traditional standard forms. Published in the UK by NEC ( Conditions of Contract for Consultancy Services (2005) (CCCS). This standard form is widely used for engineering consultancy services. It was developed jointly by the Auckland Regional Contracts Group (ARCG) and the Association of Consulting Engineers New Zealand Inc (ACENZ). Published by ACENZ ( This manual contains no specific guidance on the contract form to be adopted under this procurement procedure. Approved organisations can adopt the form of contract that best suits their requirements. Purchasers must advise potential suppliers of the proposed contract terms and conditions, including the proposed form of contract. See section RFP contents and conformity. A Guidance Note to Conditions of Contract for Consultancy Services (2005) This Guidance Note is based on a document prepared by the Auckland Region Contract Group, and verified by ACENZ, in February 2005. Reducing Bid Costs for Outcome-Based Procurements in NSW Infrastructure and Structured Finance Unit: Partnering to Create Partnerships December 2015 1. Evolution of infrastructure procurement in NSW 2. Project Assessment Framework Establish service capability July 2015 Component of the Project Assessment Framework (PAF) This document forms part of the Project Assessment Framework, as outlined below. 1.1 An initial request to enter into a contractual arrangement may be initiated by either Massey University or another party (Other Party). RIBA Plan of Work 2013: Consultation document. You are invited to complete the online questionnaire by 12 August 2012.